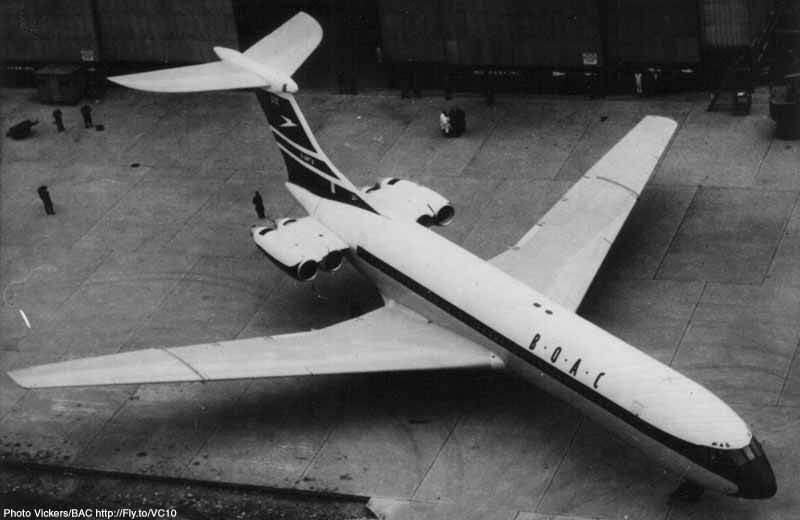 Construction number 803 was allocated to the first airframe on the VC10 production line which would actually take to the air. It was also the first airframe which would be completely fitted out as previous airframes were meant for static tests only. 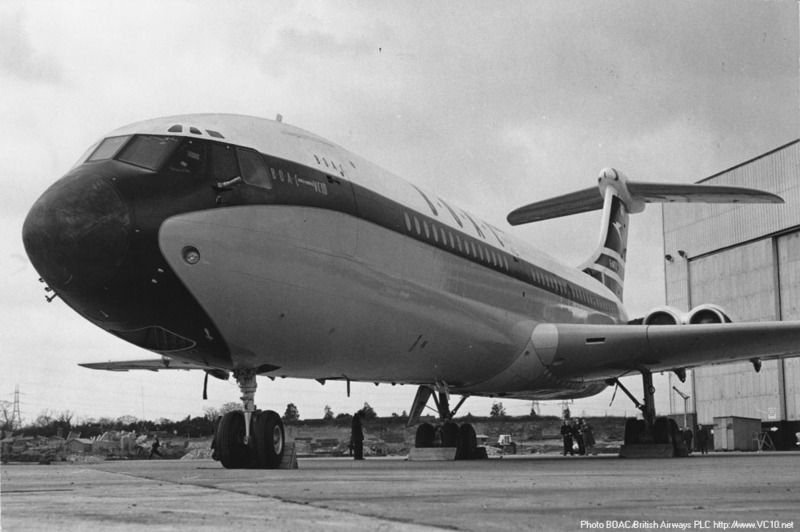 On 15 April 1962 the completed aircraft was rolled out of the factory, and two months later, on 29 June 1962 it took to the air for the first time. 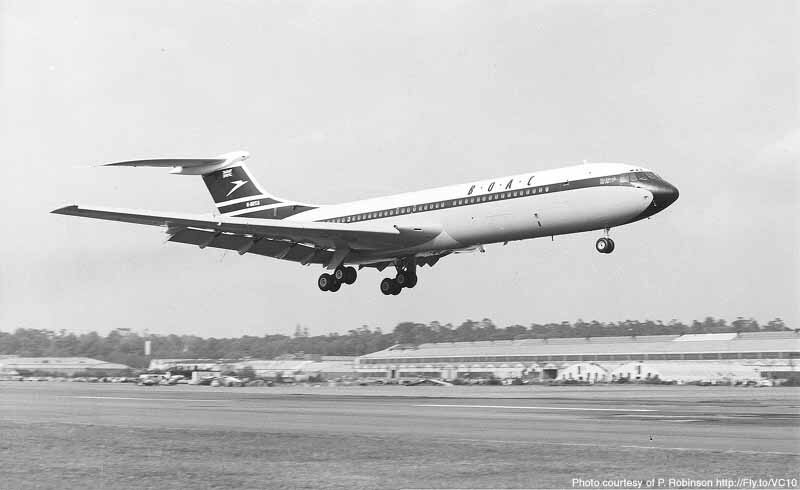 This first flight was surrounded by some uncertanties as the 1260 yard (1152m) runway at Brooklands was originally deemed too short for the VC10. The aerodynamics department did some calculating and decided on an 'unstick' distance of 550 yards (502 m). 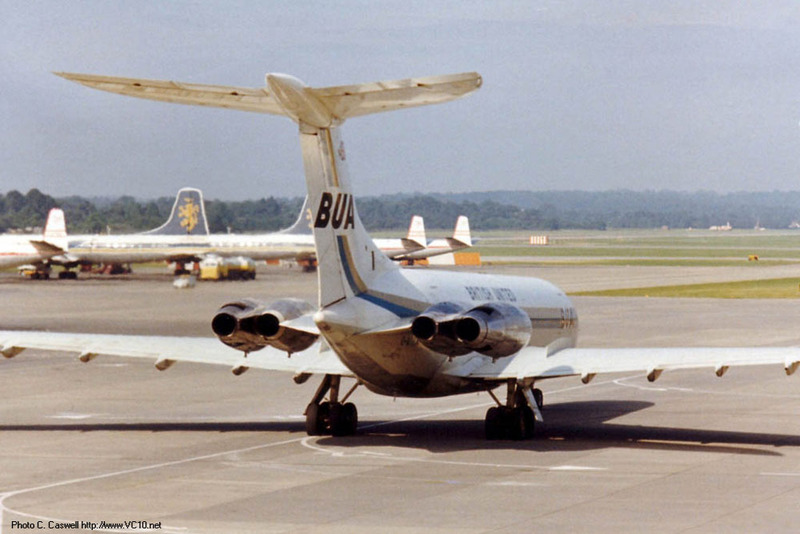 By extending the runway by 200 yards (183m) at one end, which was slightly misaligned and therefore meant making a turn at 30 knots, it was determined that a lightly loaded VC10 should be able to take off. To be on the safe side a big yellow line - about 20ft (6m) thick - across the runway warned the pilot of the dimishing room left if he would decide to abandon the take off. If this were to happen the aircraft would need all of the 1460 yards (1335m) available to stop before ending up in the grass. In the end the calculations worked out and with plenty of room to spare G-ARTA lifted off late in the afternoon for a very short flight to Wisley, BAC's flight test center just a few miles away, for further fitting out and the start of an extensive series of tests. 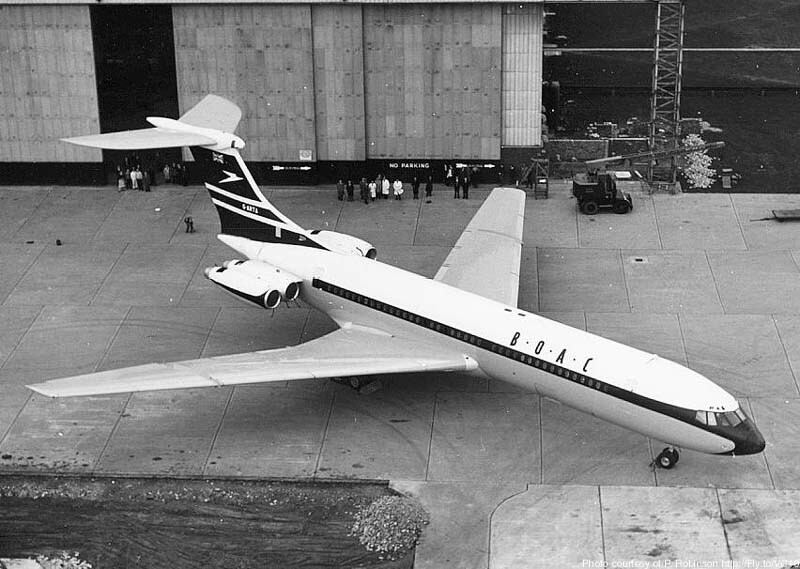 G-ARTA would remain the single prototype, but later on was joined by other aircraft which were built to production standard for BOAC but were used for development work as well. 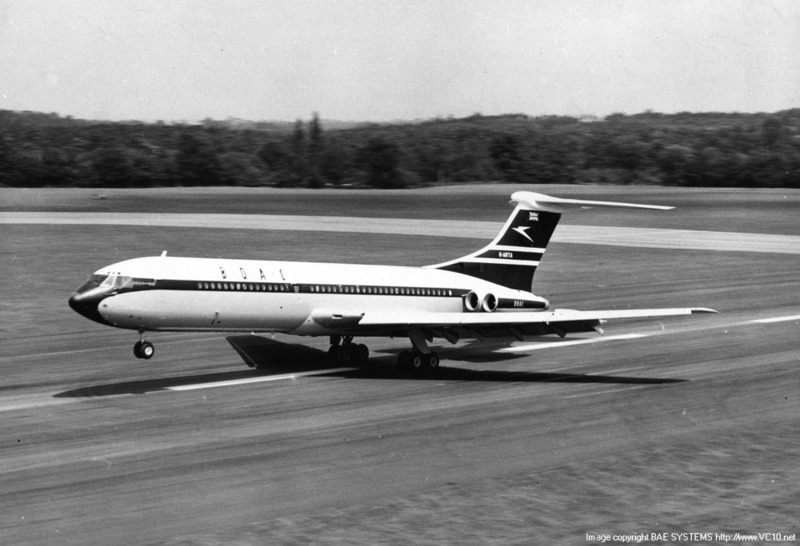 During flight testing some problems surfaced that had not been foreseen, the most important one being a significantly higher cruise drag number. To rectify this G-ARTA flew a lot of sorties, including a few from the long runway at Boscombe Down with all the flaps and slats taped over in the closed position to ascertain whether this would lead to an improvement in drag number. 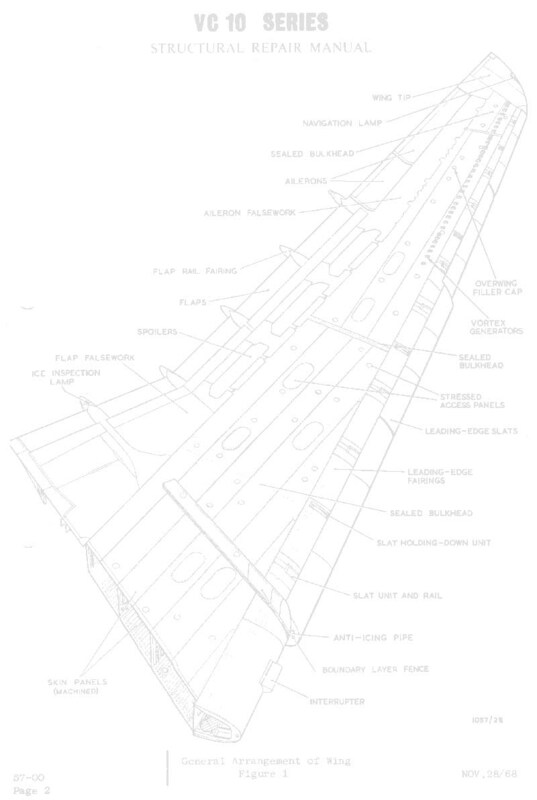 This of course meant a take off and landing without flaps or slats which explains the use of Boscombe Down's runway. 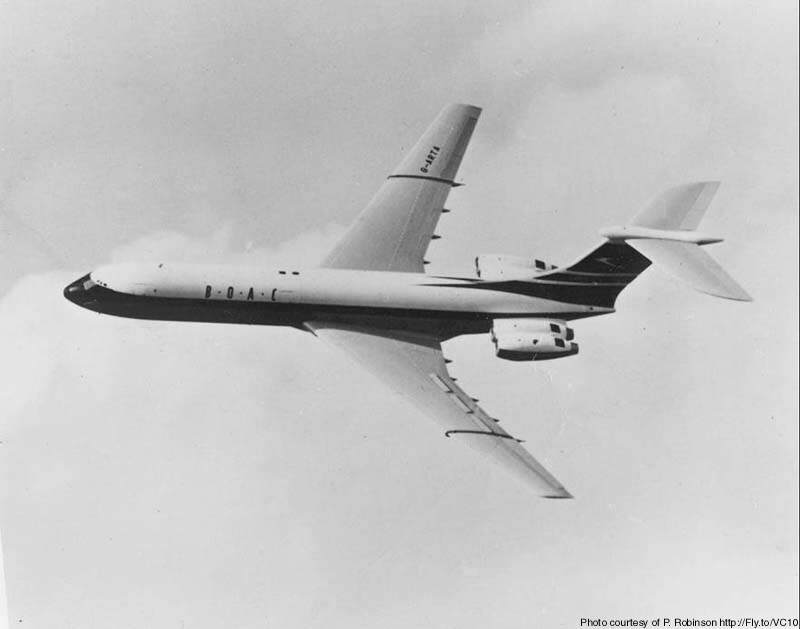 Later on tufts of fibre were attached to the airframe and it then was photographed in flight at different speeds and altitudes to find any flow problems. One of these problems turned out to be a tremendous amount of backflow that existed at the back of the engine nacelle in between the two exhausts. This led to a modification to the engine nacelle that filled up the area between the exhausts with the so-called 'beaver tail'. G-ARTA flew the entire pilot's flying manual and, in doing so, created that manual for this aircraft. 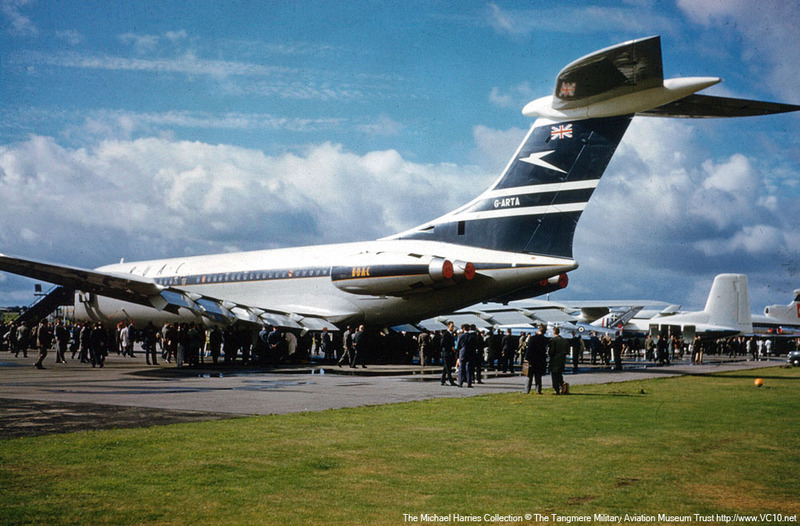 Best climb rates, engine rpm percentages rates, approach profiles, the stall regime and much more, were all part of the VC10 development programme. Over 2000 stall profiles were flown with G-ARTA to validate the issue. The aircraft would remain in its development role for several years. 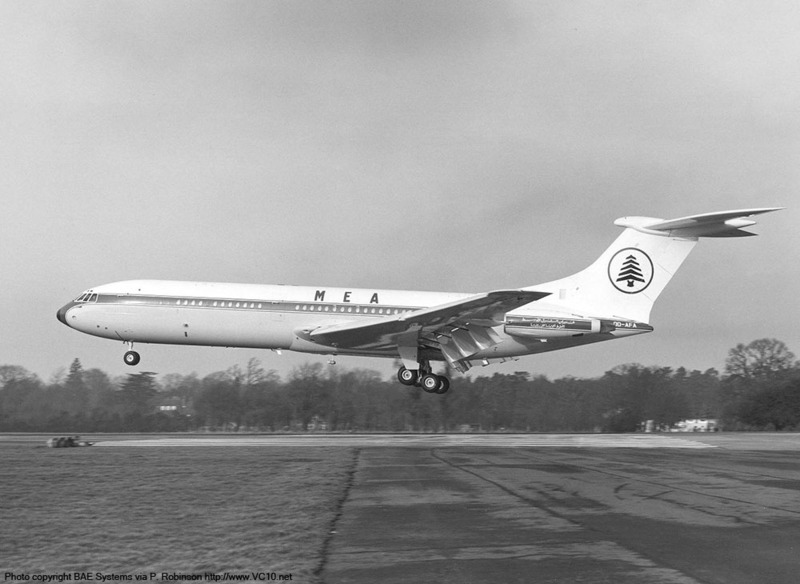 Official deliveries to BOAC and BUA had started in 1964, but it wasn't until the end of 1967 that G-ARTA was flown back to Weybridge to be converted to airline standard as a Type 1109, the only one of it's kind. 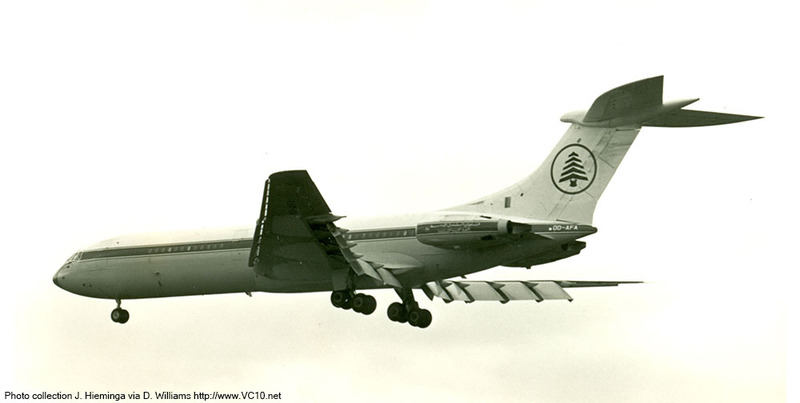 In this guise it was sold to Freddie Laker, who bought it as an investment and immediately leased the aircraft to Middle East Airways as OD-AFA. It flew with MEA for just over a year and on the end of its lease Freddie Laker sold it on to his old employers BUA. 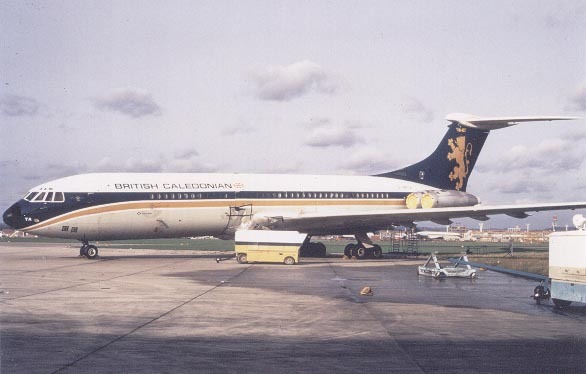 After the merger it reemerged in British Caledonian colors named 'Loch Ness'. 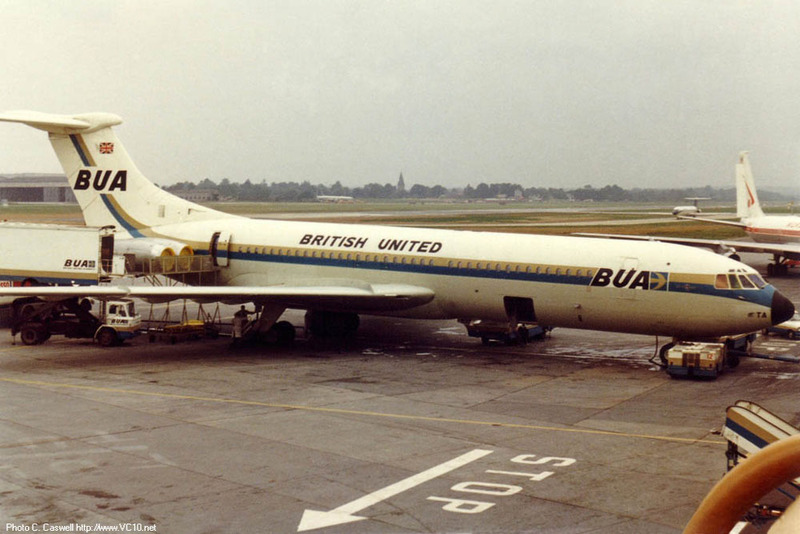 It flew on with BCal for three years until a particular arrival at Gatwick put a dent in both her career and her fuselage. 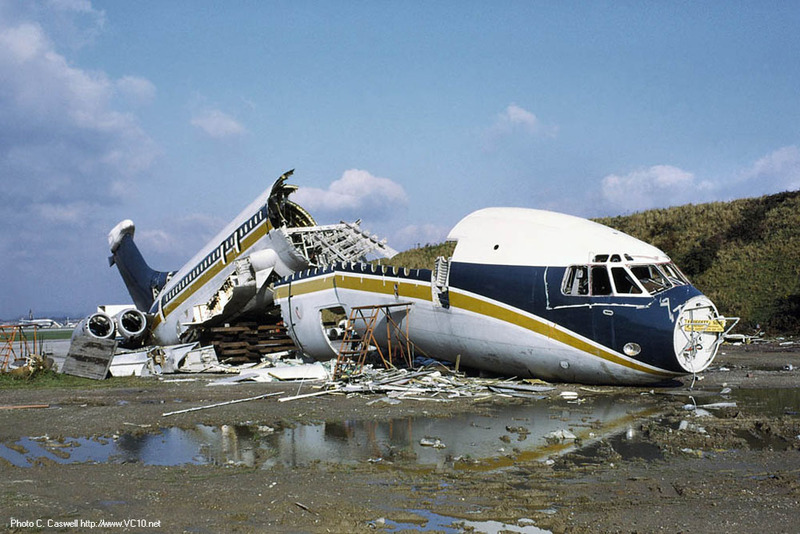 withstand a fairly heavy landing, this could with all fairness only be described as an arrival, or even a controlled collision between the VC10 and planet earth. Now while the flight crew were still wondering what went wrong the passenger on the jumpseat was counting the fillings in his teeth and asked the captain "Is it always like this?" to which the blunt reply was heard: "No it bloody well isn't. Shut up!" 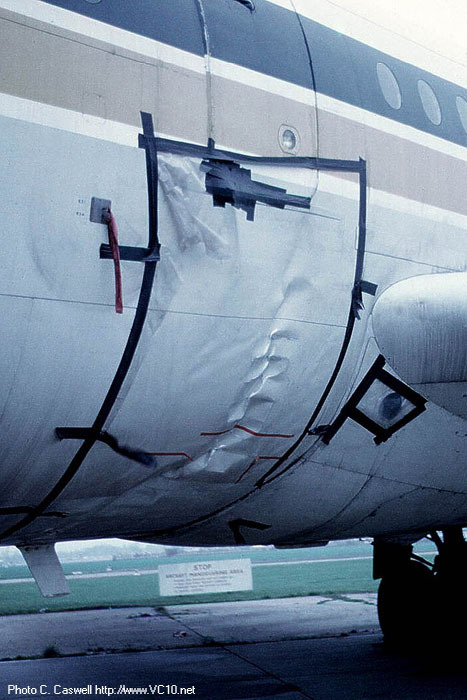 The extent of the damage done by this small error did not come to light until the aircraft was parked and they got a chance to inspect the outside of the aircraft. 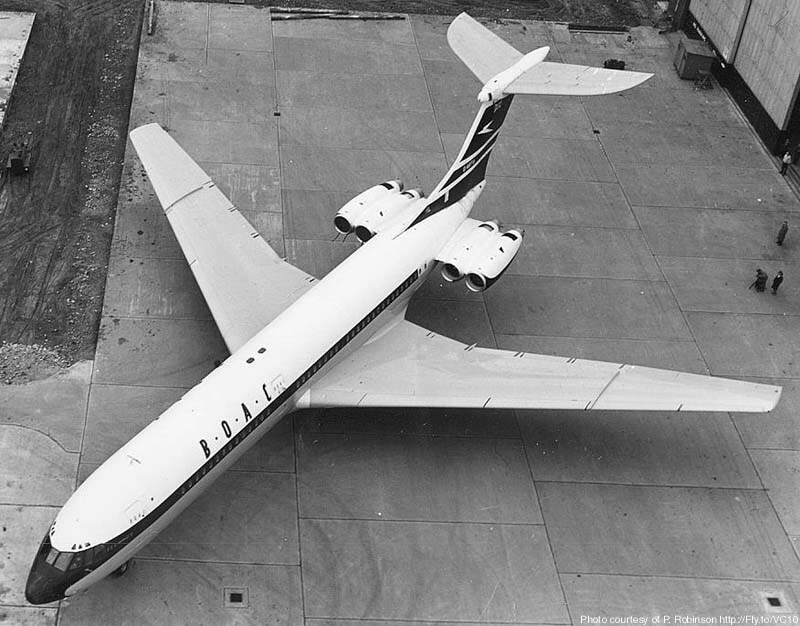 The sleek profile of the VC10 was marred by several deep creases in the fuselage undersurfaces just forward of the wing leading edge. After this the aircraft was parked in a corner of the airfield awaiting a decision on whether it would be economical to straighten her out, but in the end it was decided that this was not the case. 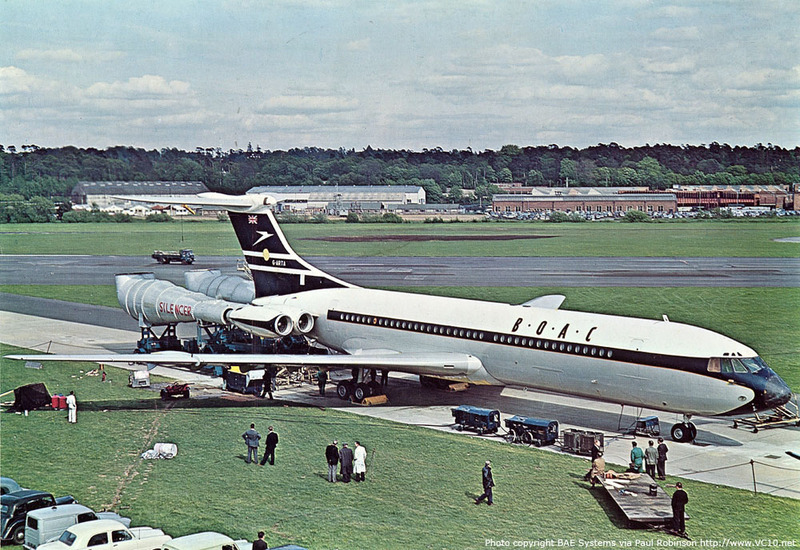 The once proud prototype VC10 was broken up and scrapped where she stood. 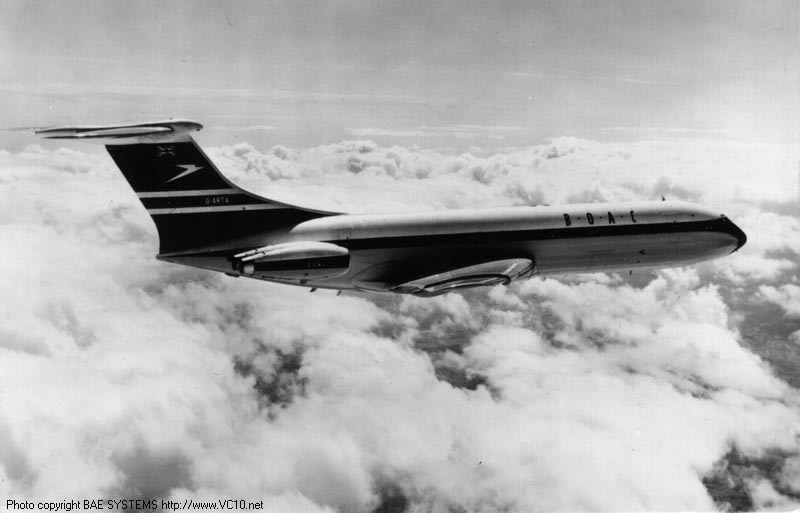 And so a small error on 28 January 1972 put an end to the career of this important aircraft. 1. 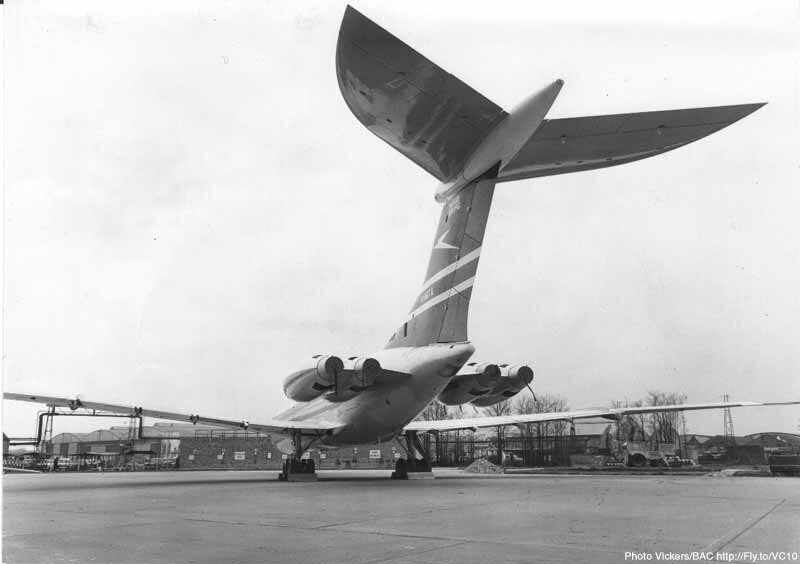 Rollout of G-ARTA at Weybridge on 15th April 1962. 2 - 3. More photos of the rollout ceremony. 4. Another view from above during the rollout ceremony. These photos were taken from a Westland Widgeon, from Bristow Helicopters at Redhill. 1&2. G-ARTA parked at Weybridge before her first flight. 3. Engine testing at Brooklands. 4. G-ARTA taking off from Brooklands on her first flight, 29th June 1962. 1. G-ARTA and G-ARVA parked at Wisley sometime during testing in 1962. 2. G-ARTA taking off from Wisley in August of 1962. 3. G-ARTA cruising over the English countryside during early testing. 4. A nice topside pass, place and time unknown unfortunately. The spoiler panels have not been modified yet so this was during the early days of testing. 1. G-ARTA at Farnborough in the early 60's. 2. 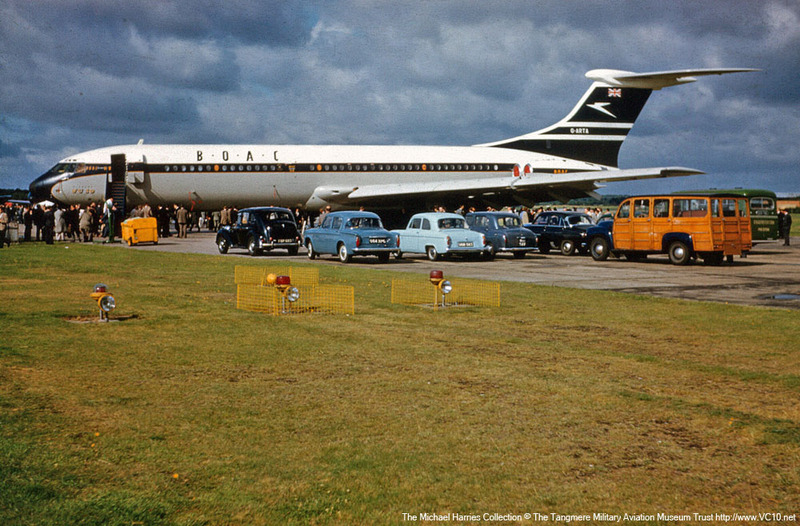 Some of the ground crew members (Jack Wright at top of stairs) disembarking from G-ARTA at the 1962 Farnborough Air Show. 3. 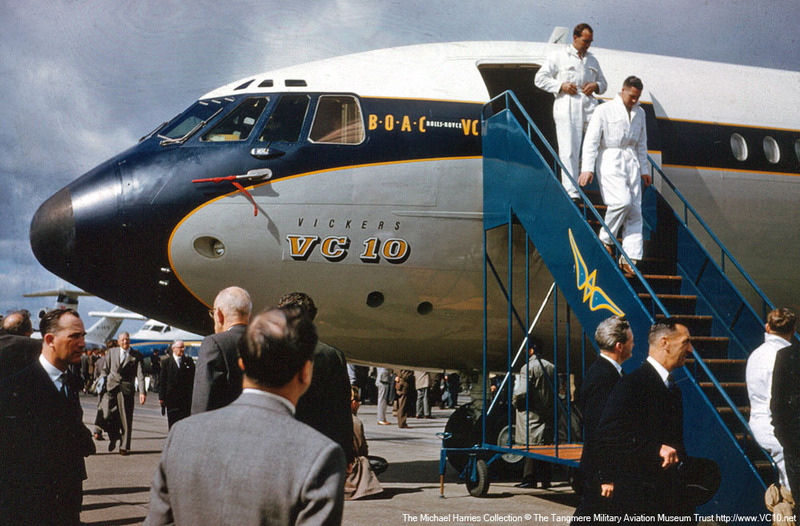 The VC10 prototype was still being flown for testing purposes by this time but painted in BOAC colours. 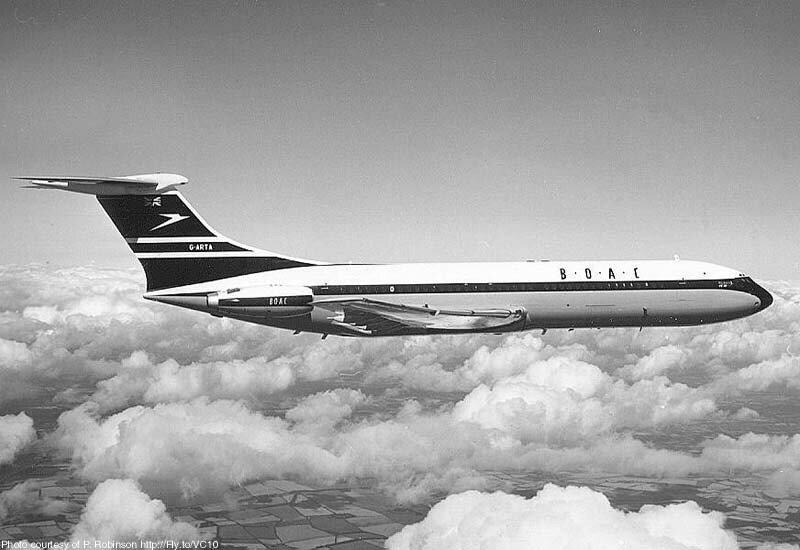 In the end BOAC never operated this airframe. 4. G-ARTA again, parked behind some period vehicles. 1. Once the testing was finished, G-ARTA was sold to Laker Airways who leased it to MEA. Having been reconfigered at Weybridge the now re-registered OD-AFA lands at Wisley after a testflight. 2. As this photo shows, the wing appears to have been rebuilt to 1103 specs with extended leading edge and cambered wingtips. 3. 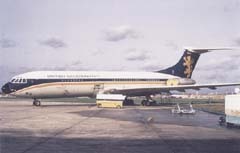 The colourscheme on OD-AFA was slightly different from the one used on 9G-ABP. 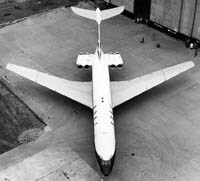 For example, the registration was not on the fin but on the extreme end of the fuselage. 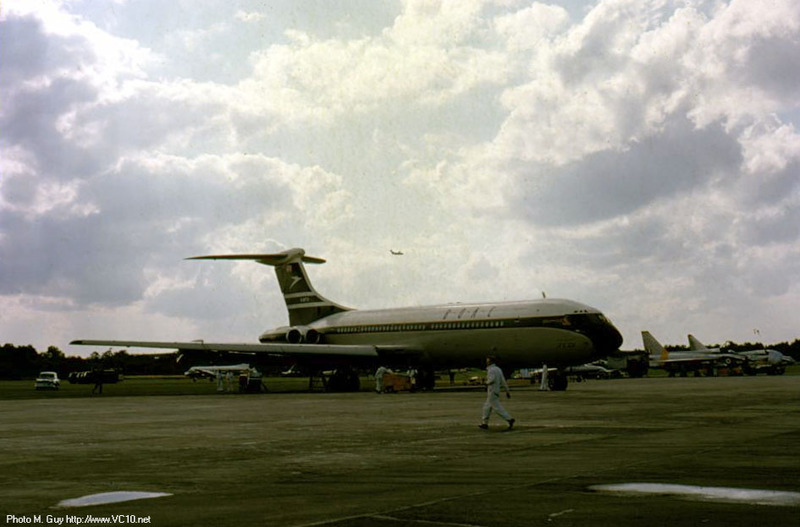 On this photo the VC10 is parked at the Heathrow maintenance base. 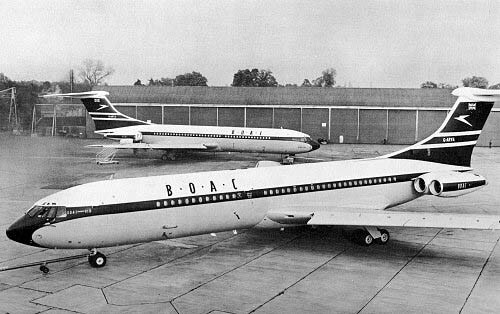 Vickers/BOAC BOAC scheme of white over grey fuselage, dark-blue cheatline and fin with two white bands over fin. 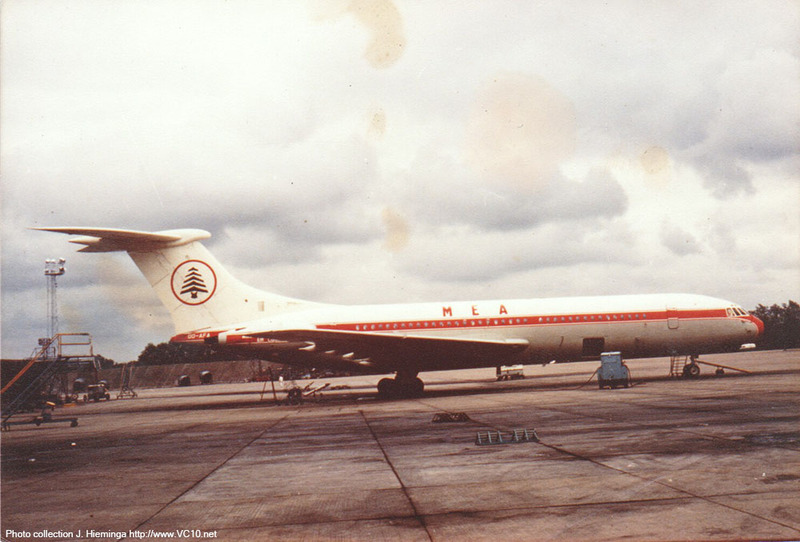 Laker Airways/MEA White over grey fuselage with red cheatline, cedar tree logo on fin.